Maria and I are not antique hounds but – like most early boomers – we have collected some family knick-knacks over our married life. We’ve had more than 45 years to do it, so it adds up. “Good” china. We have Royal Worcester Evesham – a popular choice since the early 1960s. Our stuff is mostly the older design – not microwave safe and with a less modern shape for the cups. Royal Worcester is still available so maybe this should be considered just a collectible. Silverware, or in our case the cheaper silverplate. We collected a set of Birks Regency flatware back in the 1970s. Birks does not sell this anymore so I guess it might qualify as an antique. Hummell figurines we got for Sarah when she was a child. Royal Doulton figurines. We have a few but never went overboard. We have a cabinet to make them cat proof. Wall art from mostly Ontario-based artists like Trisha Romance and Walter Campbell. A nice collection of Gibson teapots. Gibson was a major UK teapot manufacturer back in the day but have been out of business for 40 years. Does anybody use a teapot today? Paragon cups and saucers. 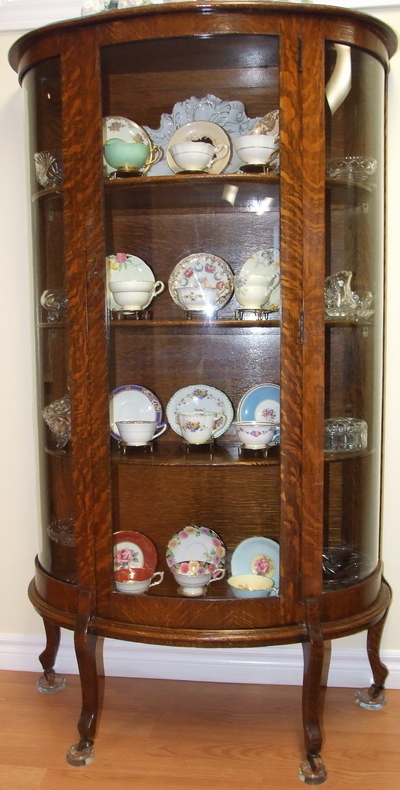 We have an eclectic set of these in various shapes and sizes ranging from the 1910s to the 1950s. Paragon is also long out of business and the records are gone. However, they always had a Royal Warrant so you can approximately date any piece. They make a nice addition to a tea party Sarah has every year for the kids in Veronica’s “Little Flower” group. Add to this a few pieces of early 20th-century furniture and you have quite a stash of stuff I guess. In past generations, this would have added up to some valuable antiques at best or treasured family heirlooms at least. Not so much today though. It seems that most Millennials and late Gen Xers do not appreciate or want the collectibles their parents and grandparents had at home. Many are late to leave the nest, have smaller spaces to furnish or prefer to go to Ikea or Crate and Barrel. For younger people, it is more about travel and flexibility than having stuff. I get this. If a Millennial collects things from the past, it might be an antique transistor radio or even an Atari video game. Horses for courses I suppose. This lack of interest in collecting our past “stuff” has sure made a difference for antique dealers and estate managers though. Maria sees a lot of rather nice crockery and flatware just be given away to the thrift store. Bricks and mortar antique stores suffer from fewer customers and their prospective ones are buying on eBay. I suppose you shouldn’t worry too much about what happens to your possessions in the long run. Maybe the key is to enjoy them and not just store them away. I have a few antique watches that belonged to my grandfathers, a historic family quilt, some other keepsakes from past generations – and I hope these continue to be family treasures. If the rest ends up as kitsch in a thrift store – well at least we enjoyed collecting it, and maybe someone else will be able to use it. I am not optimistic though, and I’m glad I didn’t buy any of it as an investment. Yesterday’s treasure, today’s kitsch. Hopefully, it’s not tomorrow’s trash. Rather depressing to grow old.